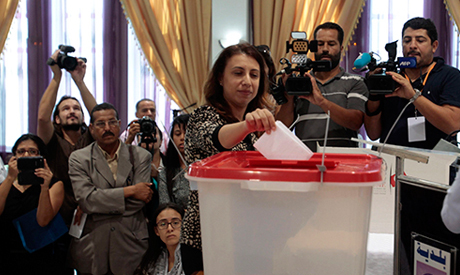 Sources from civil society organisations in Tunisia estimate the number of observers in parliamentary elections on Sunday to be approximately fifteen thousand observers. Muraqboon association, which is one of the largest polling observatory networks in Tunisia, sent around 4,000 members to monitor the electoral process. Haitham El-Zakli, spokesperson of Muraqboon association told Ahram Online that parliamentary campaigns have run smoothly thus far with problems being limited to issues such as tearing down posters of competitors. He also asserted that the voting times and locations have not been published or filtered yet. El-Zakli pointed out that Muraqboon has spotted a discrepancy between the lists of registered voters announced by the supreme body and the subsidiary bodies. He also asserted that mosques were being used in electoral propaganda. On the other hand, police and army forces began preparing for securing the electoral process, as the threat of terrorism continues to subsist. On Monday, Tunisia received devices that detect explosives from the UK. Meanwhile, the spokesperson for the defence ministry revealed that the army has killed a number of terrorists in a campaign two months ago near the western borders of Tunisia. The leader of Ennahda party called for giving his party a second chance before the electoral silence which begins on Saturday. The Ennahda leader also asserted that his party is ready to enter a coalition government in case of winning the first place in the elections. The leader of the "Nedaa Tunis" or the call of Tunisia party, the main competitor of Ennahda party also agreed that a coalition government is essential during the next five years. Sissi should send Egyptian troops to rig the elections. True democracy in Tunisia is a mortal threat to the survival of the Sissi regime which thrives on mendacity, tyranny, and mass murder.